This morning I was helping Farmer George move some cows from the home farm to our 'Runoff' 4 k's away ... With driving slowly as the leader vehicle I could not help but notice all the roadside flowers.. picked a bunch and have them in a vase on the window sill .. I think the creamy/yellow one's are spraxia's and are possibly been dumped there, there is clover, carrot weed, grass seed heads .. and a few other I am not sure about ..
A real roadside floral arrangement. Very nice. 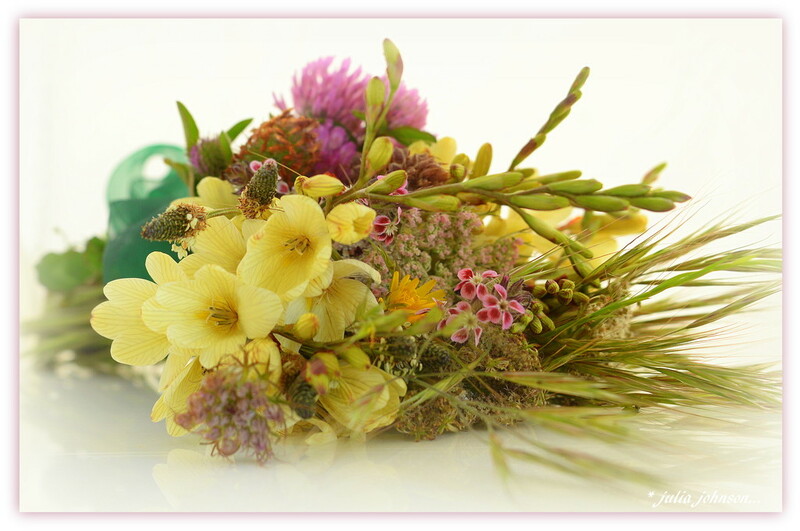 A beautifully composed arrangement of your wild flowers ! A lovely collection of wildflowers. A lovely still life. What beautiful flowers, too pretty to be weeds, smile. What a lovely collection of flowers. What a lovely selection of wild flowers. All these from your roadside...who needs flower shops! I love natural wild flowers in a simple vase loads better than formal arrangements. It's that time of year again, the Spring move, good to get some cows away to summer quarters! @happypat these girls haven't been paying their way.. so having a holiday with the Bull to ensure they get back on track again..
Lovely collection Julz, I'd be happy to have them on my table.